Read more in Lindsey Leardi’s article for ArchDaily here. This spring I was awarded a second Inspiration Grant from Arts KC to attend my first NCECA conference (National Council on Education for the Ceramic Arts) which draws thousands of ceramic art and education enthusiasts from all corners of the world. The 2018 NCECA conference was in Pittsburgh, Pennsylvania and certainly didn’t disappoint! Through this conference I saw dozens of exhibitors featuring works by ceramic artists I’ve only dreamed of seeing in person. I was part of an NCECA concurrent exhibit, “(In)Visible” featuring ceramic works by female and gender non-binary artists. I was honored to show with this talented group of artists and cheered many of them on as they presented panel discussions at the conference covering topics about mental health and being part of marginalized groups including race, religion, and gender identity. Both groups brought forth personal testimonies and sought real-life solutions as they challenged what are considered taboo notions in the ceramics community and beyond. If you would like to learn more about (In)Visible and to see how you can become involved, please visit our group online: www.wearentinvisible.org and check out the Instagram group @wearentinvisible Below is the group’s statement taken from the website. We Are Not Invisible was originally known as simply "(in)Visible," which was proposed as a Concurrent Exhibition to be presented at the 2018 conference for the National Council on Education for the Ceramic Arts in Pittsburgh, Pennsylvania, curated by Amanda Barr. The original show is a group of 30+ femme and non-binary artists working in ways that express our need to be heard. We make art about gender, sexuality, culture, religion, race, oppression, class, mental illnesses, physical disability, motherhood, societal demands on women, politics, and more. Art is our voice. (in)Visible has grown beyond a single show into a movement for support, solidarity, and visibility. We have an Instagram page, @wearentinvisible, that rotates hosts and themes, and seeks to highlight artists of all genders, genres, and ability, to bring awareness to the diversity of the world. We also have a Facebook page and are working on ways to expand and help give visibility to those who have too long been ignored. Original statement: As the 2016 election year has highlighted, deep currents of belief, experience, and culture divide our world. This exhibition seeks to highlight female and gender non-binary artists working in ceramics, who in some way feel “invisible” to the dominant culture. These artists represent struggles with physical and mental illnesses (commonly termed “invisible illnesses”), gender, sexuality, culture, religion, and race. For each of us, art is our voice and our way to make seen and heard what often goes unremarked upon. It’s nearly impossible for me to look at the title piece of Cydney Ross’s first solo exhibition, Structural Integrity, and not see a reference to the World Trade Center, destroyed on 9/11. But in this collection of eight large clay buildings and three smaller studies, the sculptor isn’t drawing such literal associations. Architecture, her art reminds us, frames our space. It represents human intervention to change the environment, and then it, too, changes, altered by more human activity or by nature’s long rebuke. 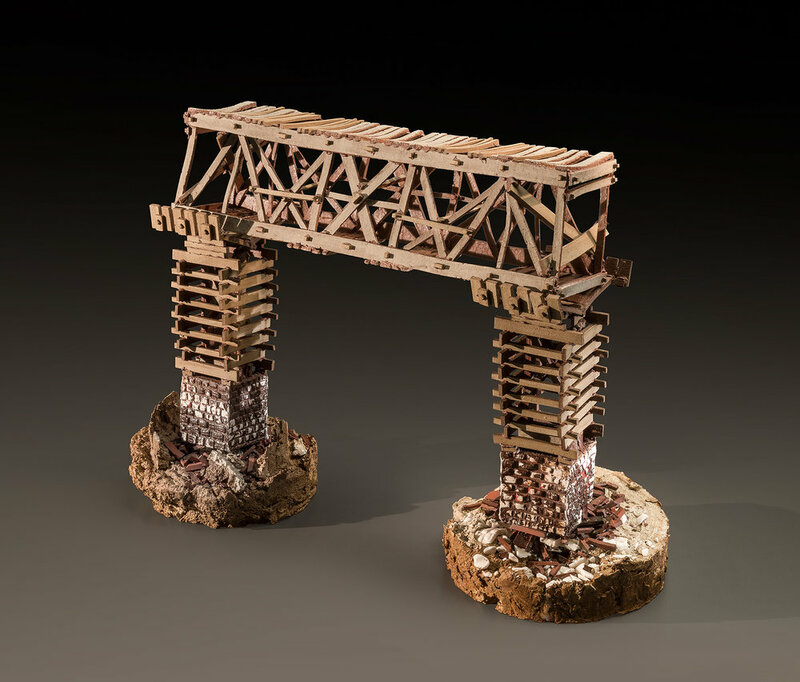 Ross, a 2013 graduate of the Kansas City Art Institute’s ceramics program and an ArtsKC advanced fellow, is interested in the arc of various structures — bridges, skyscrapers, Asian pagodas, the iconic dome of the U.S. Capitol Building. She’s drawn to the process of construction as well as by what happens much later. The deterioration, sometimes due to neglect. The tearing down. And the decimation wrought by combat. She is an optimist, though — a ruins-half-full sort. Her buildings, which rise up in twisted ways from dark bases of rich, rough earth, are not representations of a done-deal apocalypse. We see broken shards, pylon pieces, bits of rubble, yet Ross makes this somehow beautiful. The ravaging hand at work seems to have been neutral, expressing not one or another side of a conflict but rather time’s passage. Her sculptures don’t answer questions as much as they ask us what we see: a coming together or an unraveling. On the eve of her exhibition’s opening, at Kiosk Gallery, Ross told me she has tried to be politically active — attending protests, voting, donating to charities. She said she’d been inspired rather than discouraged by the conversations undertaken since the 2016 presidential election. But as an artist, she wants her work to transcend topicality. The buildings in Structural Integrity, she added, are a kind of cautionary tale. What crumbles before us at small scale prods us to make a difference while there’s time, to change things now and maybe stay ahead of disaster. Ross told me she’d been influenced lately by The Battle for Home, architect Marwa al-Sabouni’s 2016 book about Syria’s colonial-influenced built environment. Among its lessons is the way in which the Brutalist architecture imposed during the first half of the 20th century contributed to societal breakdowns. When we look at bombed-out concrete blocks in Homs or Aleppo, we don’t immediately recall that the buildings were not culturally native. Take “The Weight of the World,” a masterful rendition of the U.S. Capitol’s neoclassical forms, slumped and sunk into an upturned bowl for a base, mirroring the dome above. There are broken buildings inside, a few of them painted with highlights of gold. Money in politics, America’s vast resources, the complicity of Congress (and its electors) in violence of all sorts — these themes roll around in the tension Ross physically captures in clay. There is tension between control and chaos in all the works here, created through techniques such as overfiring terra cotta (basically burning the material until it fails) or freezing and thawing porcelain before it goes into the kiln (also a way to induce structural failure). Ross wants the unexpected to play a part in her sculptures at their creation. Natural forces (chemistry, gravity) outside of calculated control helped to build all of this art. And in every accident, Ross tells us, there may lie an opportunity — though taking advantage of any such luck to bring about change requires work. Host/producer Maria Vasquez Boyd ushers in soon to be Halloween with guests that include artists/sculptors Cydney Ross, Ari Fish, KC Voices Tom Sullivan & Barb K. Roberts, and hijinx with KC Conjure owner Julie Valdivia & the incorrigible artist Mark Allen. 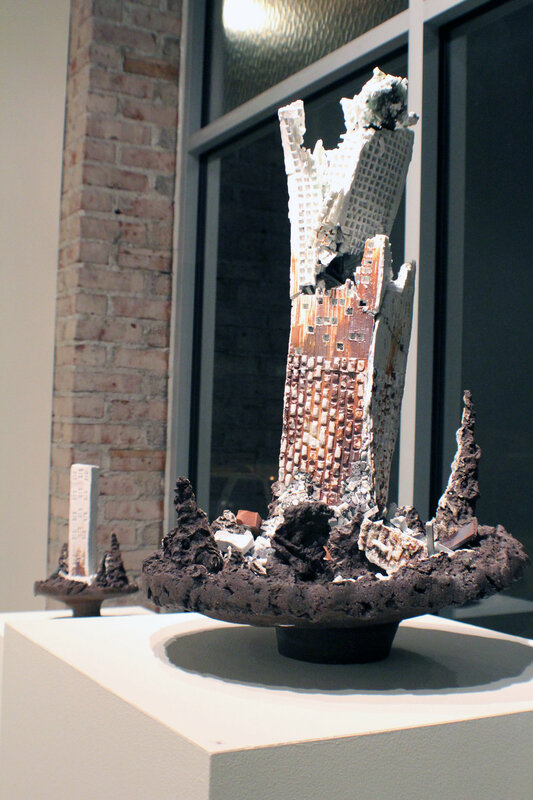 Kiosk Gallery presents “Structural Integrity” – a solo exhibition by Kansas City artist Cydney Ross, featuring new ceramic sculpture works. Ross seeks inspiration in aging architecture, and the ways built environments shape communities and culture – comparing the influences of physical structures with the effects of government policy and political discourse. The show runs through November 9th during open hours and by appointment; Kiosk will have some extended hours this month in celebration of the International Sculpture Center Conference in Kansas City. Weight of the World, 2017, porcelain, glaze and luster. Courtesy of the artist. Kiosk Gallery presents Structural Integrity – a solo exhibition by Kansas City artist Cydney Ross, featuring new ceramic sculpture works. Ross seeks inspiration in aging architecture, and the ways built environments shape communities and culture – comparing the influences of physical structures with the effects of government policy and political discourse. The artist’s reception will be held Friday, October 20th, 6-9 pm. The show runs through November 9th during open hours and by appointment; Kiosk will have some extended hours this month in celebration of the International Sculpture Center Conference in Kansas City.